Mesa rallied for two in the bottom of the 8th cut a three-run deficit to one, but could get no closer in a 3-2 loss to Salt River. Just two Nationals got into the game yesterday — Brian Goodwin and Matt Skole. Goodwin returned to his usual spots in the lineup (No. 2) and the field (CF) and went 1-for-3 — one of just five hits the Solar Sox managed against the Rafters — but was caught stealing. 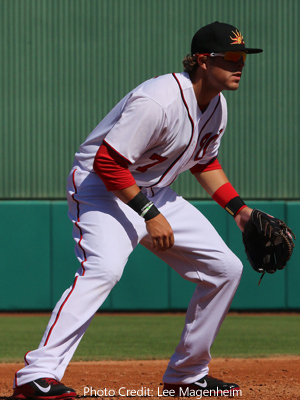 Defensively, the Nats top outfield prospect had three putouts and no assists. Skole’s tailspin continued with an 0-for-3 game, though he did draw a walk while batting 8th. The 24-y.o. corner IF is hitless (0-for-12) in his last four games. He played third base and had one putout (foul popup to end the 4th) and one assist (groundout to end the 5th). The loss shaves Mesa’s lead over second-place Salt River to 2½ games with the two teams rematching tonight in Salt River. Matt Purke is scheduled to make his fourth start of the fall season.